International Nurses Day (IND) is celebrated every year on 12th of May to commemorate the birth anniversary of the Florence Nightingale and to mark the nurses’ contributions towards people’s health.International Nurses Day 2018 was celebrated by the nurses all across the world on the 12th of May. 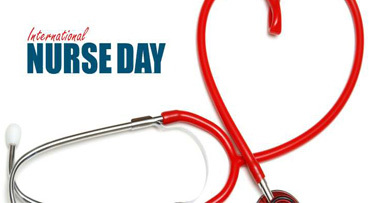 Nurses Day was first proposed by the Dorothy Sutherland (an officer from the U.S. Department of Health, Education and Welfare) and first proclaimed by the President Dwight D. Eisenhower. And it was first celebrated by the International Council of Nurses (ICN) in 1965. In 1974, the 12th of May was declared to be celebrated as the birthday anniversary of the founder of modern nursing, the Florence Nightingale. International Nurses Day Kit (having educational and public information materials to be used by the nurses among public) is prepared and distributed every year by the International Council of Nurses while celebrating the Nurses Day. Promotional and educational activities are organized while celebrating the International Nurses Day annually to address lots of nursing issues. The theme of celebration is selected based on nurses and environment, handling poor, poverty issues and many more. It is celebrated as a week - long event, referred as National Nurses Week, in many countries like Australia, United States, Canada and etc. International Nurses Day is celebrated every year by organizing a candle lamp service in the Westminster Abbey, London. A candle lamp is handed over from one nurse to another (symbolizing to pass the knowledge from one nurse to another) to place it on the High Altar. A big ceremony is also held at the St. Margaret’s Church, the Florence Nightingale burial place, a day after her birthday. It is celebrated for week long in the US and Canada as a National Nursing Week from 6th of May to 12thof May. Varieties of nursing ceremonies are conducted during the whole week celebration in the Australia. National Nurses Week is the whole week celebration targeting the health care services on international level. It is celebrated to recognize the contributions and commitments of the nurses among common public. American Nurses Association supports and encourages the celebration of National Nurses Week all through states and districts nurses’ associations including other health care companies and institutions. Whole week celebration is planned to commemorate the nurses’ significant role in caring patients. Activities are held such as educational seminars, variety of community events, debates, competitions, discussions and etc. Nurses are appreciated and honoured at this day by distributing gifts, flowers, organizing dinners and etc by the friends, family members, co -workers (doctors, administrators, and patients).